Do not eliminate the negative! That advice may be very sound for living your life – but it’s not so valid when it comes to horse training. There is a debate raging in the world of horse training – which is better: positive reinforcement or negative reinforcement? People are very quick to leap onto the side of positive reinforcement, many going so far as to say that it’s the only “right” way to train … every horse … in every situation. Sounds good, right? Rewards over smacks. Carrots over sticks. Trouble is, it’s not a choice of “treating” over “beating” – and negative reinforcement has far more practical applications in horse training. and rather clinical, I admit. Blame it on behavioral scientists! 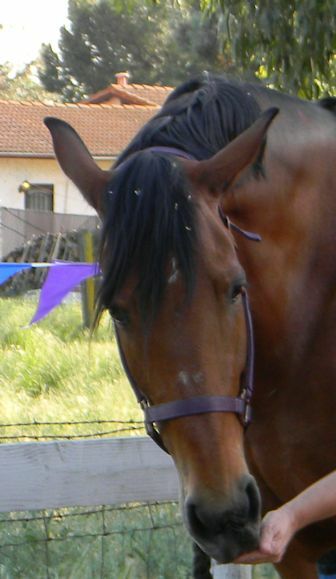 Both methods are actually considered as rewarding – in the first, the reward is a carrot or a scratch; in the second, the reward is the cessation of the stimulus. Negative reinforcement is not punishment, and it is only “bad” if the stimulus used is stressful. It is, however, often a more expedient way to train and confirm a behavior (some studies have even shown better retention in horses with this method). Behaviors are usually placed under stimulus control [with negative reinforcement] at the onset of training. In positive reinforcement the animal is allowed to practice the behavior randomly before it is placed under stimulus control. waiting for that random step backwards? 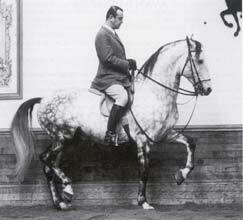 And, since you are not yet putting a cue with it, you will have to repeat the waiting scenario many times before your horse begins to make an association with his random step backwards. Neither positive nor negative reinforcement – this is flooding, and it has no place in horse training! In the negative reinforcement scenario, I would begin to train backing up with either very slight pressure on the halter or very light taps on the horses chest. Depending upon the horse’s sensitivity, I might be tapping or pressing for a while before I got a reaction. If I received absolutely no reaction for some time, I would slightly increase the pressure or the taps (emphasis on “slightly”). At the instant the horse makes a move backward, I immediately cease the pressure/tapping. With this approach , I am not only giving the horse a “clue” as to what I want, I am also teaching an aid/cue from the beginning. Reliable response to a cue is what is meant by “stimulus control”, and negative reinforcement is a more direct path to achieving it. NOT negative reinforcement, since there is no release of pressure offered by the rider. to do. Whether you ride with purely weight aids, or use spurs and double-bridles, you are using pressure and release – i.e., negative reinforcement. You press, lean or pull, and (if you are fair about it) you cease as soon as the horse responds. I suppose you could start by getting on and waiting for your horse to take a step so you can give them a treat – but with some horses that I have started, you could be waiting for a very long time! Of course, you probably have a voice cue … but your goal is to develop a leg cue. Then there is stopping … you could start shaping that by waiting for the horse to happen to stop … could be a little dangerous. The fact is, negative reinforcement works well when you can easily touch your “pupil” – and riding is done in constant contact with the horse. Don’t throw out the carrots! Using positive reinforcement has helped Tally get over her spookiness (note the flapping flags behind her, yet soft eyes). 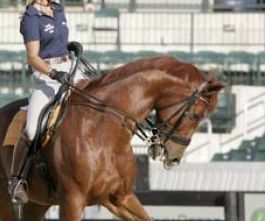 example, most horses are likely to eventually approach a scary object, given enough time. They are naturally curious, and if the object does not give chase, they will eventually want to check it out. I have found it very easy to speed up this process (and thereby reduce actual “spooking” behavior) by giving a treat each time the horse takes a step toward a scary object. Gradually increase the time between each reward, so they have to advance further to get it, and you could soon have a horse that leads you to the scary object! This entry was posted in Horsemanship and tagged Horse training, negative reinforcement, positive reinforcement, punishment, reward, stimulus. Bookmark the permalink.